Plus: Gillette Venus tweet stirs conversation; more legal problems for Boeing; Facebook tries to be less creepy. 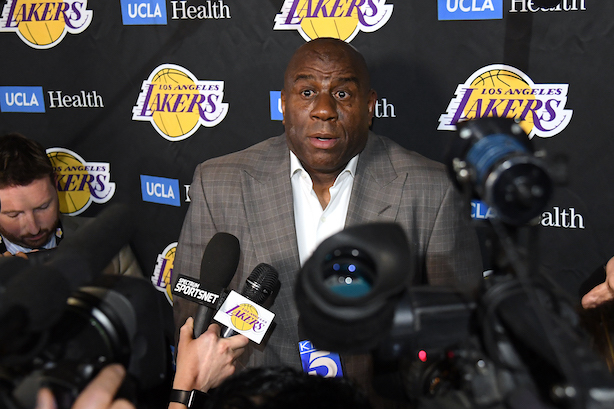 Basketball legend Earvin "Magic" Johnson threw a surprise press conference on Tuesday night to say he’s stepping down from his front-office job after the Los Angeles Lakers again failed to make the NBA Playoffs. The presser was also a surprise to Lakers owner Jeannie Buss, who evidently had not been told Johnson was quitting before he spoke to the media. Lakers fans surely have mixed feelings about Johnson’s front-office tenure, but he’ll always have a special place in the hearts of Brooklyn Nets fans for trading D’Angelo Russell. A Gillette Venus tweet starring plus-sized model Anna O’Brien wading into the ocean in a bikini has started plenty of conversation on social media. Some Twitter users have accused the razor of exploiting O’Brien or even "celebrating obesity;" others gave the P&G brand kudos for embracing body positivity. More legal troubles for Boeing. A shareholder lawsuit is accusing the company of defrauding investors by hiding safety problems in the 737 Max, the plane involved in two crashes in six months. The suit said that Boeing "effectively put profitability and growth ahead of airplane safety and honesty," according to Reuters. Meanwhile, airlines effectively stopped ordering the 737 Max in March. Holy copyright violations, Batman! Here’s your regular reminder not to rip off other people’s work in marketing. President Donald Trump’s re-election team removed a campaign ad from the president’s Twitter account on Tuesday after Warner Bros. threatened legal action over the unauthorized use of the score from "The Dark Knight Rises." The video was viewed more than 2 million times before it was taken down. Facebook is trying to be less creepy, though sadly not in terms of how it shares user data. The company is making an effort to remove trauma-inducing reminders, like the ones encouraging you to wish a dead friend or relative a happy birthday or add him or her as a friend. The social network is employing AI to "minimize experiences that might be painful," COO Sheryl Sandberg said in a post.